Any state the size of Texas is bound to be chock-full of naming potential. Turning back the clock to the state's rich history brings many renowned names to mind (Sam Houston, William B. Travis, Jim Bowie, and Davy Crockett to name a few). For Texas, a mention of the past quickly draws a vivid image of a frontier with saloons, gun fights, and cattle drives. From these symbols we have gathered a slew of dog names that would make any Texan proud. From the Battle of the Alamo to the wild west stereotype, this is a list of names for those that love the Lone Star state. One way to find some name ideas is to turn to your fellow Texans. Several US Presidents have called Texas their home. Dwight D Eisenhower, born in Denison, was the 34th President of the United States. While in office, Eisenhower was often seen with his Weimaraner named Heidi. Perhaps more well known for his dogs, was Lyndon B Johnson. The most famous of the bunch were a pair of Beagles named Him and Her. Johnson's other dogs included Edgar, Blanco, Kim, Freckles, and Yuki. George W Bush has often been seen with his Scottish Terrier named Barney and an English Springer Spaniel known as Spot. Not all of the fame in Texas belongs to people. The state is home to many well-known dogs and even has its own breed, the Blue Lacy. The Blue Lacy, or Lacy Dog, is a strong working breed that emerged in the 19th century and has been adopted as the official state breed of Texas. Perhaps one of the most famous dogs to call Texas home is Old Yeller from the self-titled Disney classic . A descendent of Rin Tin Tin moved to Texas in the late 1950's, where the bloodline has remained since. Among other dogs that hold a place in Texas history are Reveille, Texas A&M's mascot, and Skidboot, known as the 'World's Smartest Dog'. Some of our pages will contain a subcategory. A subcategory is a slightly more specific grouping than the main topic of the page. For a subcategory, we will include a separated table of names and corresponding descriptions. An example of a subcategory of Red Dog Names would be 'Dog Names Inspired by Red Wines'. 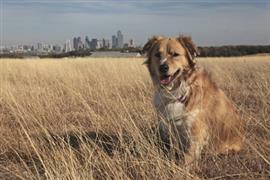 If you have any subcategory ideas for the Texas Dog Names page, we would love to hear them. Use the form below to submit your ideas.